​But you have to start with the facts, so we have tried to lay out here what happens if you do nothing, if you are (i) a married couple with children; (ii) a married couple with children who are not all children of your spouse; or (iii) unmarried, with or without children. How the state will distribute your assets may or may not match what you want to happen. If that is the case, give us a call so we can get you on the road to peace of mind. This looks okay on its face- after all, if you and your spouse have young children you understandably trust that if something happened to you, your spouse would take care of the children. But what many people overlook is that time goes by- your spouse may re-marry and have other children; also what happens when your children are adults? There is nothing in the law that preserves assets for them after they have grown up. This is especially important if you have family assets that you want to make sure stay in the family- interest in a family business, a family vacation property, etc.​ The most common way people address this is through a trust or living trust that allows the surviving spouse to use income from the assets but preserves the underlying assets for the children after the last parent dies. As with the prior example, real property and bank accounts that you own jointly with your spouse will go to your spouse automatically without being in your will- no problem. Your life insurance proceeds will distribute automatically according to your beneficiary designations- also something you can take care of without an estate planner. As to the rest of your assets, the first $100,000 and half of the remaining assets will go to your spouse, and the remaining half will be equally divided among all of your children. Again, the law tries to be fair and to approximate what you would want in your estate plan, so this may not sound so bad. But remember that (i) what is by far the largest part of most people's estates- your home, your life insurance policies, and any retirement savings that you have listed your spouse as beneficiary for- will pass to a person who is not the biological or adoptive parent of your other child or children; and (ii) if your children are minors at the time, they cannot receive an inheritance directly, without someone setting up a trust vehicle to manage that inheritance until they are adults. There is really no way to sugarcoat it- if you have children that are not either the biological or adopted children of the person you are married to, you need a will, and likely also a living trust, as part of your estate plan. If you are unmarried with children, all of your estate will pass to your children in equal portions. If you are unmarried without children, your estate will pass to your parents in equal portions, or if neither of your parents are alive, to your siblings in equal portions. If you have no siblings, the court will look for your nearest surviving relatives, usually first cousins. If you have no children, this may not be that different from what you would want in terms of distribution of your assets. What a will can provide you even in this instance is a clear set of directions for your family, so they do not have to spend time and money in the probate court establishing who has a right to receive what. If you have children, especially if any of them are minors, there are key things the law will not accomplish for you if you do not have an estate plan. First, the court will have no direction from you about who you want to become guardian for your minor children. You should know that in all cases the court will appoint someone to be a guardian- the law will not let your children slip through the cracks like that- but without a will you lose the ability to name that person, as well as any other criteria that are important to you in raising your children (religion, education, etc). Second, a child under the age of 18 cannot receive money directly, and someone will have to set up a trust for your children to receive the inheritance. You have the opportunity through your estate plan to set up a trust yourself, in which you can not only create a vehicle for your children to inherit, but also choose a trustee and set whatever guidelines for use and distribution of the funds that you think is in the best interests of your children. Even if the plan the state makes for you in terms of who gets your assets more or less matches your wishes, there are important things that a will, or a combination of wills and trusts, can do for you and your family members. 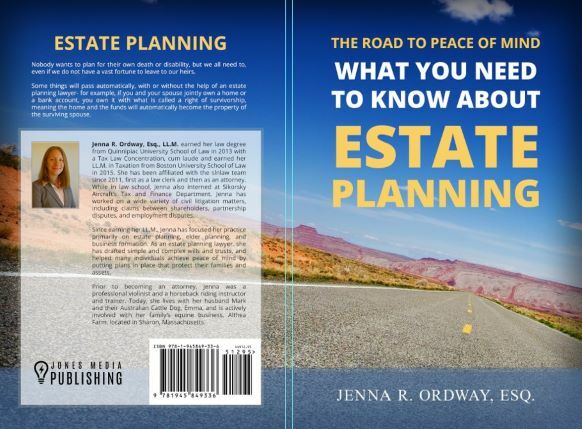 Estate taxes: by not creating a plan, you may be missing opportunities to avoid or minimize the estate taxes that your heirs will have to pay. In Massachusetts, your taxable estate will include retirement funds, life insurance, and other assets even though they pass automatically. This means that if you have a significant life insurance policy, equity in your home or other real estate, and retirement plans for you and your spouse, you may well exceed the $1 million threshold for the Massachusetts estate tax. As careful plan that combines wills and trusts with an annual family gifting strategy that can takes advantage of any available tax exemption for gifts. Probate process: if you do not have a will, your family members will have to go through the probate process to distribute your estate. This will include asking the court to appoint a personal representative, and if you have minor children, asking the court to decide who will be their guardian and how any assets they inherit will be held and managed until they become adults. These are both things you can designate in your will. If you also use trusts in your estate plan, you can reduce or even eliminate in some cases the need to involve the probate courts. It is estimated that the cost of the probate process can eat up 3% to 8% of the assets available leave to your loved ones. Your own disability or incapacity: an elder law or estate plan should also account for what happens if you or your spouse become incapacitated, or if either of you need long term or nursing home care. A durable power of attorney allows you to identify someone to make financial and legal decisions if you are incapacitated, and a health care proxy allows you to identify someone to make medical decisions for you. Depending on where you are in life, you may also want to consider the use of an irrevocable trust to protect your assets in the event that you need long term care or nursing home care. Request your free copy of our book "The Road to Peace of Mind". Starting the new year right: estate plan resolutions to consider in the new year. What you should consider when naming an executor or personal representative in your will. Reasons a will alone may not be enough to accomplish your goals. ​6 Mistakes to Avoid in your estate plan. Issues women should consider in addressing their estate plans. Elder law: how to talk to your aging parents about their estate plans. Ready to Get Started on a Plan? We are ready to help you put a comprehensive plan in place that meets all of your needs and your family's needs. We have a simple process for getting you from wherever you are now to executed and final documents and your peace of mind. It starts with an initial consultation, which is absolutely free. You can use the button below to schedule your consultation, simply give us a call at 781-784-2322, or fill out our web form.